Sammallahdenmäki is located approximately 20 km from the centre of Rauma. There are roadsigns on every highway on the way to Sammallahdenmäki. Information points at the parking places provide brochures and information on the site. Sammallahdenmäki can be entered freely. Signs guide visitors to the site from highways 12 and 8 and from road 2070. Sammallahdenmäki is a part of the Tracing the Past network of historical sites. Accessing the site is easy with your own car, and for groups with a charter coach. Both parking places are suitable for coaches. For groups travelling with a coach, the recommended way to visit the site is for the coach to leave the group at either one of the parking places and pick the group up at the other parking place. Public transportation does not reach the site at the moment. The closest bus stop is at the centre of Lappi village, which is 4.5 km from the Southern information point. Reaching Sammallahdenmäki by bike is relatively easy: a route can be found on the Outdoor map. Two information points are found at the parking places. The address of the Southern information point is Savulaaksontie 181. The Northern information point is located along Sammallahdentie road, approximately 500 metres from the junction of Eurajoentie (road 2070) and Sammallahdentie. The information boards at the information points provide information on Sammallahdenmäki and the Bronze Age as well as some brochures. The information on the boards is available in Finnish, Swedish and English, and additionally the brochures are available in German and French. Ecological outhouses are found at each information point. The outhouse at the Southern information point is accessible. 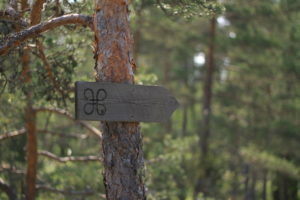 A 1.5 km guided path circulates the area and it is suitable for hiking independently. The paths are marked with looped square signs (below). For the time being, there are no information boards along the paths. The summer guide is available on weekdays in July. Guided tours start at the Southern information point (Savulaaksontie 181). The fee for the guided tour is €2/person, children under 18 years and students free of charge. The Bronze Age lives in Sammallahdenmäki! 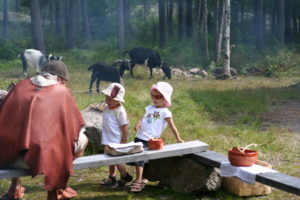 A visit in Sammallahdenmäki can contain an experience, where the Bronze Age comes to life. The programme is carried out at a clearing by the Southern parking place. A programme of 2–4 hours can be realised for big groups as well, when the group is divided into tribes. Dynamic programmes are especially suitable for groups of pupils. Catering and ancient-style storytelling is available for adults, too. The ancient remains are protected! The ancient remains are protected by the law. Digging, covering, changing, damaging, removing and other forms of interference are prohibited. Using the existing paths is recommended to protect the sensitive vegetation. Making a fire and using any vehicles is prohibited. The burial site of Sammallahdenmäki is privately owned, so remember to follow the everyman’s rights.